This is part two of my three part series comparing various Canadian and American investment accounts. 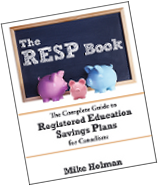 This post deals with the Canadian RESP and the U.S. 529 plan which are both educational savings accounts. For the 529 account we are only looking at the 529 savings account (not the pre-paid plan). In part one I looked at two retirement accounts – the Canadian RRSP account and the American 401(k) account. In the next post I will be comparing the TFSA vs Roth IRA. Please note that this is just a general comparison – it’s not intended to be reference material for any of the accounts listed. Not all of the rules are consistent within each country so there are exceptions to the “similarities” and “differences”. A big thanks to Madison from My Dollar Plan for helping out with this series. These accounts are intended for post-secondary educational purposes and have penalties if the money is not used for that purpose. Tax sheltered – any income, dividends, capital gains earned in the accounts are not taxed. After tax money is used to contribute to these accounts. This means that there is no tax refund for any contributions (some states are the exception however). RESP gets a 20% grant (matching contribution) based on the contribution amount where the 529 can be eligible for different grants (including zero) according to the state. RESP is run by the federal government (except for one province) – 529s are administered by each state. 529 contributions limits are much higher than those of the RESP. RESP withdrawals used for educational expenses are taxed in the hands of the beneficiary – 529 withdrawals used for educational expenses are not taxable. RESP accounts allow any type of investment – 529 plans are limited to mutual funds and annuities. Overall the two educational savings account types are reasonably similar given that they are both tax sheltered and require that the earnings be used for educational purposes. It is difficult to compare these two accounts beyond that since there are different rules for each state. If you live in a state where there are no contribution benefits to the 529 then that is a disadvantage to the RESP (not to mention the 529 account in all the states that do give some contribution relief). On the other hand it’s possible that your state might give contribution tax benefits which are greater than that of the RESP. Interesting. I’ve never even heard of a 529 (and we tend to get bombarded with info about US financial products). Is the 529 well known to most Americans? Maybe not? That might explain the underwhelming response to this series? Thanks for posting this. I’m always interested in these comparisons. I’ve read a lot on American PF blogs about the ins and outs of 529 plans (most recently at Interesting Money), but summer vacation must be a slow period for posts and comments about education savings plans. Looking forward to the TFSA/Roth IRA post. LS – thanks for the link – that is a very good description of the 529 plan. As canadians, we have an resp for our son. he wants to go to a college in the usa. ( fall 2010 ) ie: n. carolina. can we use his canadian resp $ to attend this n. carolina college, or any other he chooses in the usa, and is accepted at? g. bryant – I believe that you are allowed to use resp money for education in the US. Can I use 529 for my son to go to University in Canada? How would a Canadian be taxed on monies from a 529 College Savings Plan if it were used in Canada? Can a single account be both things? So if I’m a dual US-Canadian citizen living in Canada and filing taxes in both countries, can I set up an RESP and register the same account as a 529 for the purposes of filing my US taxes?